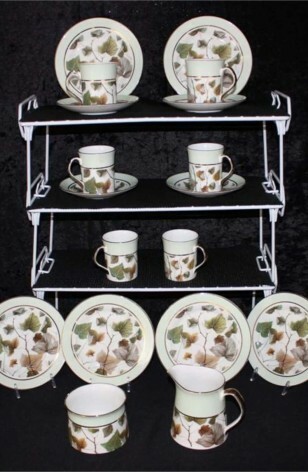 Vintage - Clare China by Elizabethan, an Autumn Leaves Style Pattern #CLX15, A Set of (18) Pieces, Circa 1950's. This is a Beautiful Elizabethan China Tea/Coffee Set from the 1950's. We do not know the actual pattern name. However, it is a Botanical, Tan, Gray and Green Leaves, encircled by Mint Green Band. Items have 22kt Gold Verge, 22kt Gold Rims, and 22k Gold Handles on the Creamer and Tea/Coffee Cups. A Rare and lovely Mid-Century Set. In really great Condition for it's age.